Imagine a gorgeous place where your favourite beauty brands come together. That would be enough, right? Add some beauty experts edits and opinions, from a leading magazine, to make your life easier when choosing the best products for you. Then, top it off with a real shop full of friendly and approachable professionals in the counters. Enough? Thought so, but there’s more: online shop with the superb Ocado delivery service, within a chosen 1 hour time slot. Too good to be true? Maybe, but it’s real. All this is Fabled by Marie Claire. And you can experience it right now as I have an exclusive 15% discount code for you, lovely readers, to start shopping online right now: VOU039323938, valid until the 26th October 2016. To me, the concept is genius: an online shop tons of amazing beauty brands covering makeup, skincare, hair and fragrance, supported by the magazine expert edits, reviews and trend watching. Beauty lovers that might be short for time, or are not sure about what red lipstick to go for, now have a haven to make their lives easier and help them nail they beauty needs. And The Fabled Shop in London’s Tottenham Court Road? Dreamy! I was about to place my order at fabled.com and decided I needed a new foundation. Took the opportunity to try the new Urban Decay All Nighter foundation. So I went to the shop for a colour match, as I work nearby. Even though I told the lovely makeup artist on the UD counter I was not buying, she was lovely, helpful and super friendly. I also wanted to get myself a new eyeliner – I went for Estée Lauder Little Black Liner. Obviously both will be reviewed soon! Now to the order. The site is clean, well categorised, so it is easy to use and find what you’re looking for. You can also look for specific brands, skin concerns, the Marie Claire edit and specific filtering within categories. They have an online chat to help you in those decisive hours and placing the order is very quick and painless, with Ocado delivery (free over £15, £3.90 otherwise) slots from 5:30 am to 11:3pm. And you can attach it to your grocery shopping. Now, that’s as exciting as it is dangerous! Remember, you can get 15% off right now with my code VOU039323938, valid until the 26th October. At fabled.com and at their fabulous The Fabled Shop at 21 Tottenham Court Road, London, you can find Aveda, Aromatherapy Associates, Balance Me, Bobbi Brown, Benefit, bkr, Burberry, Clinique, Caudalie, Crabtree & Evelyn, Chanel, Dolce & Gabbana, Essie, Eyeko, Estée Lauder, Eylure, ghd, Giorgio Armani, Gucci, Hugo Boss, He-Shi, Lancôme, Lipstick Queen, L’Oréal Paris, Marc Jacobs, Maybelline, Nails Inc, NARS, OPI, REN, Rimmel, Seche, St. Tropez, Skin & Tonic, T3, This Works, The Balm, Tom For, Urban Decay, Zelens (breathe) and much more. In modern society we many times concentrate on the physical and end up forgetting about our minds. 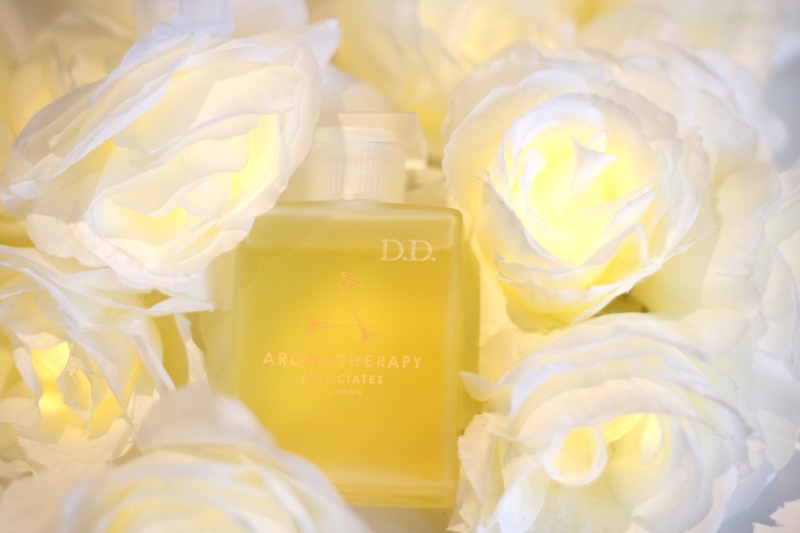 Aromatherapy Associates is here to help us to take some time to look after our skin as well as our minds, and maybe indulge a little bit on their fabulous products. Inner Strength is an all over mind and body range that counts with the usual fabulous bath and shower oils, but also skincare to help rebuild our natural strength and protect our skin from the effects of environmental and emotional stress, designed for sensitive skin. It contains camomile essential oil, calming for the mind and soothing of the skin, plant-based probiotics to rebuild and protect skin’s natural defence, cotton thistle flower, which restores skin layers and helps the regenerative process and arnica flower, a great anti inflammatory. The Inner Strength Skin Recovery Moisturiser is a protective moisturiser that calms an soothes, helps build the skin protective barrier and helps restore the skin healthy aspect. The moisturiser is light, applies and absorbs well and behaves under makeup. The scent is pleasant and reassuring. It is perfect combined with the Soothing Facial Oil, which feels very luscious and replenishing on the skin, at night. The Inner Strength Soothing Repair Mask is a bliss to use. I’m a big facial mask fan and this feels like a thicker cream. The scent is reassuring, slightly more intense than the moisturiser; I like rubbing the Inner Strength Bath and Shower oil on my hands, then on my chest to inhale, while using the mask before the shower. Skin, as well as the mind, feels revitalised. It’s moisturising, plumping, strengthening and soothing. This mask contains, sodium hyaluronate from soy, camomile as plant based probiotics. The full range, already available to buy contains, apart from the Skin Recovery Moisturiser and the Soothing Repair Mask, the Soothing Cleansing Balm, Soothing Serum and Soothing Facial Oil, which joined the already existent Inner Strength Body Oil, Bath & Shower Oil and Candle, which you can buy here. And to see how much I love these guys, you can read my Aromatherapy Associates Clear Mind Bath and Shower Oil. Mindfulness. Something that is so talked about nowadays but still not exercised enough by most of us. 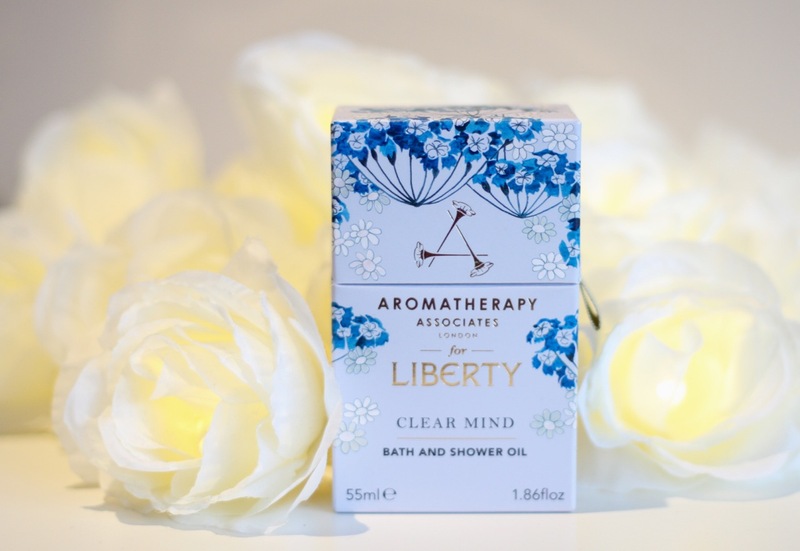 Aromatherapy Associates and Liberty are here to give us a little helping hand with the gorgeous Clear Mind Bath & Shower Oil, which was born to help us “find peace in a frantic world”. This fabulously thick and aromatic oil contains chamomile, frankincense, palmarosa and bergamot. They went through 12 blends before perfecting this gem which aims to help free our thoughts, achieve stillness of mind, live the present moment, which are principles of mindfulness, as well as revitalising the mind and body. The smell is powerful, its texture silky. What I really like is that they teach you how to use it in the shower, which for me is perfect (my low blood pressure makes baths an unpleasant business). Just drop a 50p size amount on you hand, rub and inhale twice or thrice, before rubbing it onto your torso and tummy. It may sound weird, but just the first pat of the routine made me clear my mind completely and focus on the aromas. I felt revitalised, and happy. When showering, the aromas are still release, and sink deep into our tissue. I really enjoy the whole ritual. It does make you step out and take time not to think about anything, and be present. Mindfulness is something really close to my heart, as an anxiety sufferer. I did struggle a lot to find it, and after a lot of hard work, it became easier. And this oils is a great nudge towards it; it gives you that daily dose, even if for a short period of time, of stillness. And this is great. The oil comes in a handcrafted bottle; mine has my initials – nice touch, Liberty! It sits in a beautiful box designed especially for the collaboration, using one of Liberty’s iconic floral prints, Genevieve, from AW03, which colours marry the ingredients quite well. 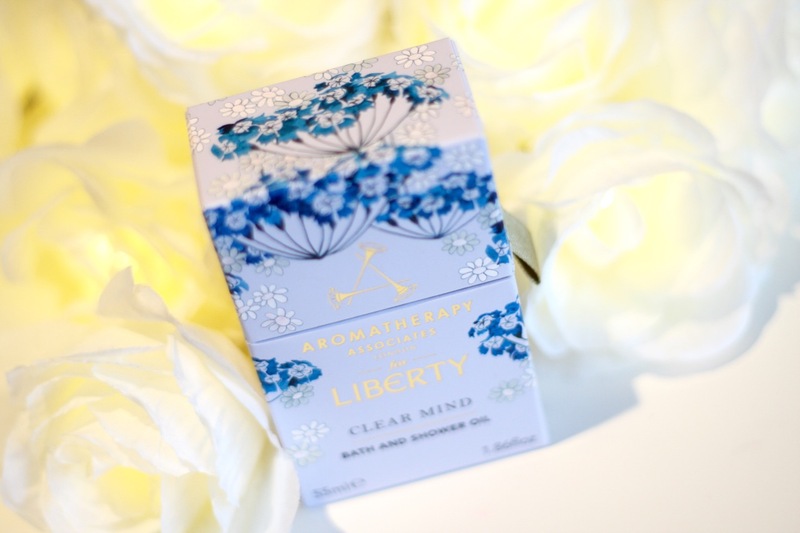 Aromatherapy Associates has a personal connection to Liberty. Its founder, Geraldine Howard, bought her wedding in the store, which I thought I was quite a cute story to add to this collaboration. At the launch, in one of Liberty’s amazing private rooms, all carved in beautiful wood, in line with the iconic store stunning interior, we were treated to a fantastic hand massage. I chose calming, and the soothing it brought me (added to a glass of bubbly) was quite overwhelming. 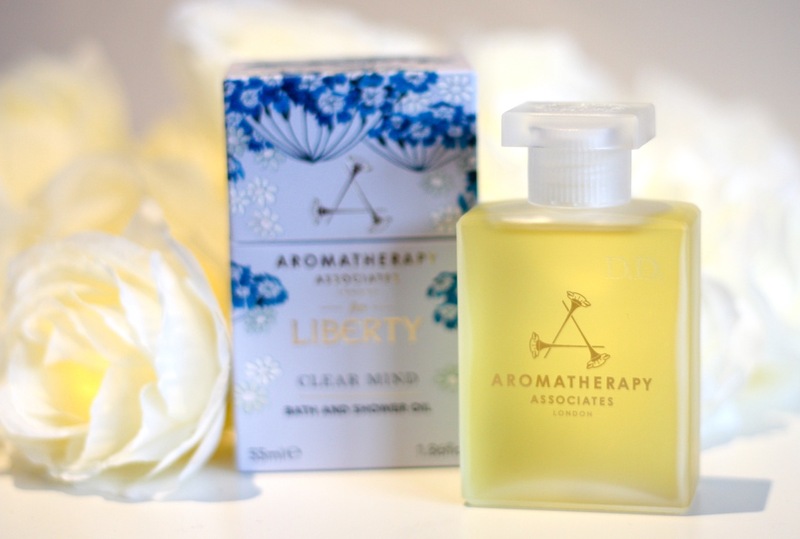 The Aromatherapy Associates for Liberty Clear Mind Bath & Shower Oil costs £48 for 55ml and has at least 20 uses, and it available exclusively at Liberty, in-store, I recommend a trip over any time, I just love the place, and online. And if you want to read more about my obsession with oils, it’s all here!